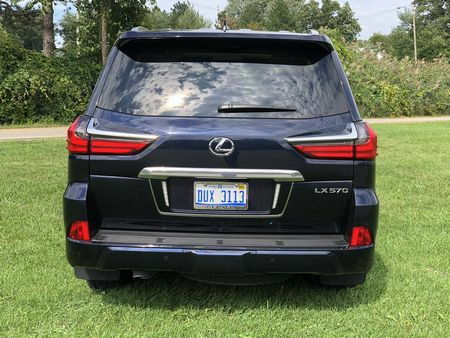 Sharing its underpinnings with the Toyota Land Cruiser, the Lexus LX was the brand's first sport utility and truck-based model, and made its US debut in 1996 as a 1996 model. 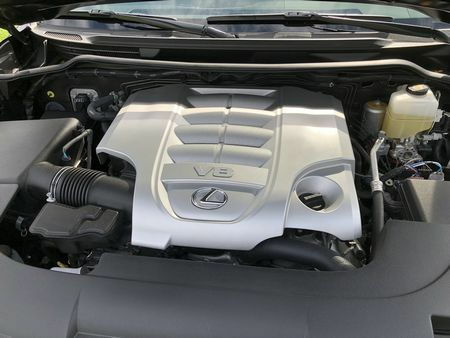 Always offered with a single V8 powertrain, the full name – LX 460, LX 470, LX 570 – coincides with the engine displacement. It competes with other big body-on-frame SUVs in a class that includes the Mercedes-Benz GLS-class, Land Rover Range Rover, Infiniti QX80, and Cadillac Escalade. The current generation LX debuted in April, 2007 at the New York Auto Show as a 2008 model with a new 5.7-liter V8, and a new 570 model designation. It was given a mild facelift for the 2011 model year, a more substantial one for the 2013 model year, and a third facelift for the 2016 model year that included an all-new interior, and new exterior body panels that included everything but the doors and roof. The LX's grab for social status begins up front with a larger-than-life interpretation of the corporate hourglass grille. Move past that landmark – if you can - and you're faced with a handsome-looking, large, SUV replete with square shoulders, large, L-shaped, LED tube taillights, the posture of an NFL lineman, and split tailgate that harkens back to a 1960's Ford Ranch Wagon. A bit of sculpting along the flanks neutralizes what could easily have been a slab-sided look, while the side sills do their best to hide nine inches of ground clearance – a non-issue for suburbanites courtesy of a suspension that can be lowered by two inches, reducing the daunting task of ingress and egress. That bold sheetmetal is wrapped around an opulent, formal wear-friendly, leather- and open-pore wood-lined interior, nearly bereft of exterior noise, with plenty of space for five adults in the first and second rows - with those up front treated to supportive, generously sized chairs slathered in soft leather that offer a comfortable station, even after hours of freeway driving. For those whose interests tilt towards the sybaritic, richer, softer leather, ventilated front seats, heated and ventilated middle row seats, a heated wood- and leather-trimmed steering wheel, a Mark Levinson audio system, refrigerated console storage, and a dual wide-screen rear entertainment system are offered as options. Most functions are controlled by user-friendly knobs, buttons and switches, with off-road options directed from the center console. Sightlines out the front and sides and back are excellent, thanks to relatively narrow body pillars and plenty of glass. 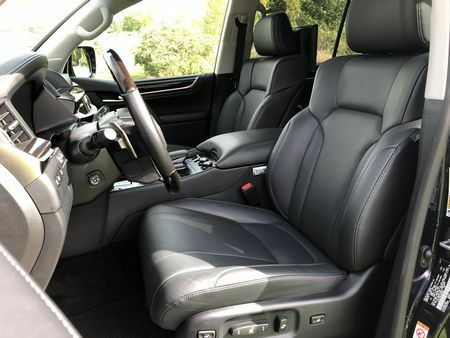 There's plenty of leg, hip, shoulder and headroom for both front passengers as well as three full-sized adults in the middle seats that are just as comfortable and also split, fold, and recline. 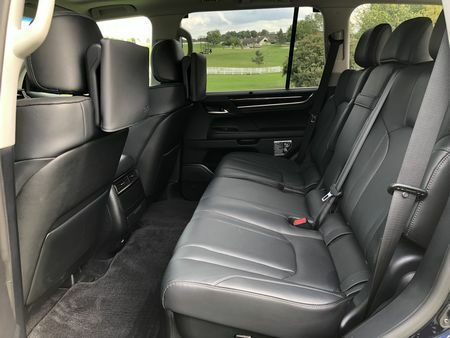 The third row comes replete with heating, air conditioning, the requisite cup holders, and the choice of six-passenger (via second row captain's chairs) or seven-passenger (courtesy of a second row bench) seating configurations. Overall fit and finish is outstanding, while soft-touch surfaces can be found nearly everywhere and even surfaces on the lower doors executed in hard plastic look and feel good. Cargo volume for the two-row model measures 32.1 cu ft behind the rear seat that expands to 50.5 cu ft with the back seats folded. At the same time, the LX is compromised by truck-based frame and corresponding high cargo floor, while the three row model features three seat belts in the back row – a bit optimistic considering it's little more than a pair of jump seats that flip up and rotate to the sides - creating a narrow space that limits cargo capacity. 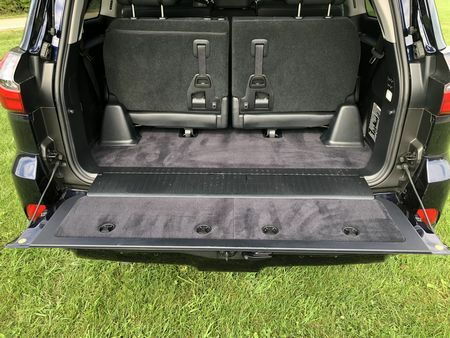 In fact, volume behind the rear seat in models with three rows is a miniscule 16.3 cu ft that expands to just 24.8 cu ft with the seats stored. Even with the middle seats flipped forward to maximize capacity, storage space is only 44.7 cu ft – more than 31 cu ft less than a Honda CR-V. 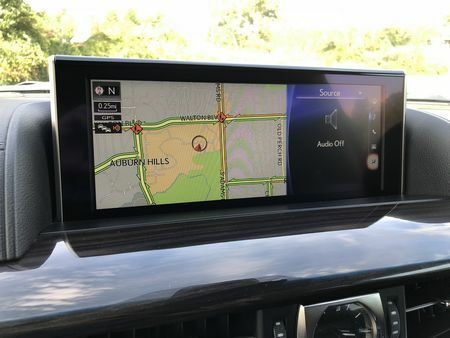 Finally, the stunning 12.3-inch infotainment screen is handicapped by the brand's outdated, haptic-feedback, mouse-like controller that's not only irritating, but often too distracting to operate when driving, and, topping things off, Android Auto and Apple CarPlay aren't even offered. A single engine and transmission are offered. The 3UR-FE 5.7-liter DOHC all-aluminum V8 generates 383 horsepower at 5,600 rpm and a maximum 403 lb-ft of torque at 3,600 rpm. It's mated to an eight-speed automatic that offers manual gear selection via steering wheel-mounted paddle shifters. Fuel economy is an EPA-estimated 13 miles per gallon in the city, 18 on the highway, and 15 combined. 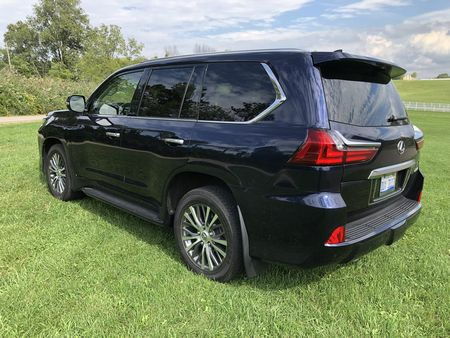 The LX's smooth, composed ride – courtesy of soft tires with high sidewalls and beefy front and rear anti-roll bars – is better on pavement is than the Toyota Land Cruiser it was cloned from. 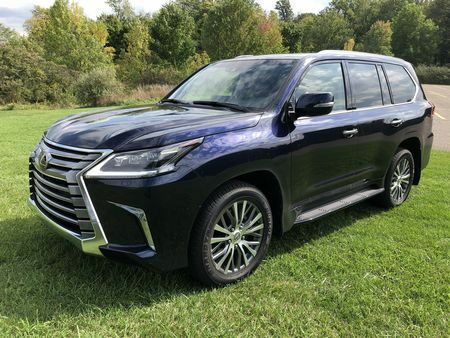 And despite tipping the scales in the neighborhood of 3 tons, it passes strongly with plenty of power in reserve and sports a towing capacity of 7,000 pounds - , again, thanks to the 5.7-liter V8 it also shares with the Land Cruiser. 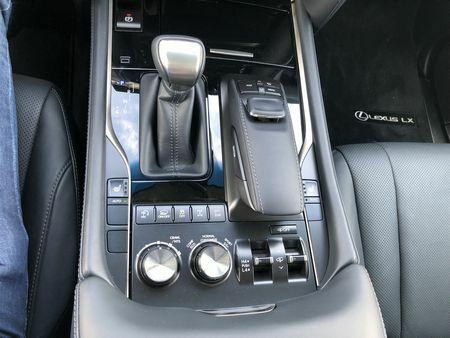 But while the suspension is also inherited from the big Toyota, Lexus adds a bit of tech finesse with an adjustable ride control system that also raises and lowers it, along with a five-mode traction control system engineered to match the suspension height to the road surface. Off-road, the four-wheel-drive system splits power 40:60 front to rear through a Torsen limited-slip differential that can be locked with the press of a console-mounted button. 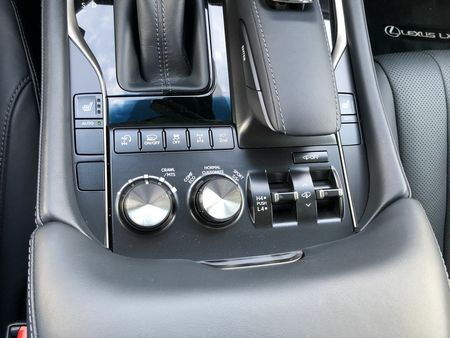 Another knob adjust the crawl control system to keep the car moving at a constant speed over any terrain, while another button operates the traction control system that clamps the inside wheel to give the LX a tighter turning radius, helping to mitigate its elephantine bulk. But like nearly all body-on-frame sport utilities, there are a number of drawbacks that come with the LX's territory. 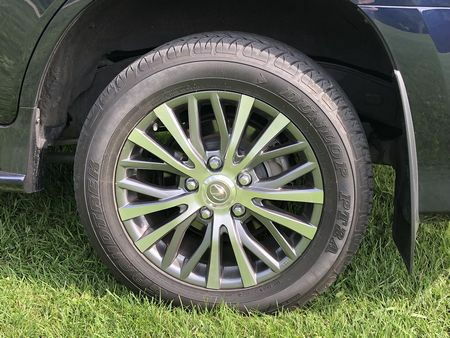 To begin with, the tires and suspension may absorb bumps with ease, but they don’t communicate much of the road through the light but numb steering system. In addition, the low front air dam reduces the approach angle, while copious body lean is the norm when cornering. Not only that, it takes a moment, once you hit the gas pedal, for the LX to gather itself before it thunders off the line due to an eight-speed transmission that seems to go through a "let me think about this" moment before responding to its electronic signal. Finally, fuel economy numbers, using premium fuel, no less, are abysmal compared to anything but a Hummer. While this used to be par for the course for vehicles like this, most big SUVs are now onboard the efficiency wagon – relative, to be sure, with competitors offering more efficient drivetrains. 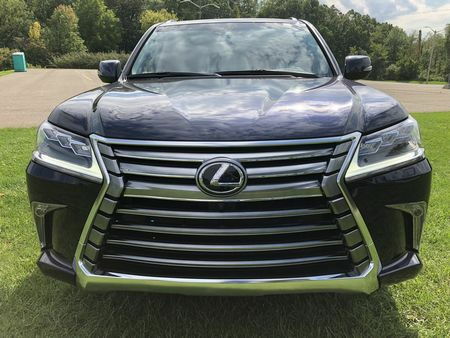 2018 Lexus LX570 pricing begins at $87,125 for a two-row model sans packages and options, and tops out at a lofty $99,710 for a fully-optioned three-row example. 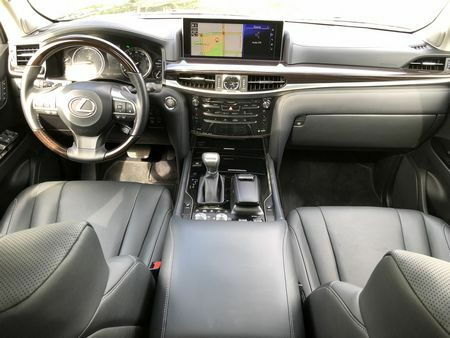 Aside from the new choice of either two or three rows, Lexus offers just a handful of options including Luxury, Mark Levinson audio, and rear-seat entertainment packages, as well as individual color head-up display, 21-inch wheel, console cool box, heated steering wheel, and wireless device charger options. That’s really not a problem, because in addition to the usual power bits, standard equipment includes 20-inch alloy wheels, LED headlights and fog lights, 14-way power driver's seat, keyless push-button start with fob and smart-access key card, leather seats, four wood trims, a powered wood-rimmed steering wheel, sunroof, analog clock with GPS functionality, four-zone automatic climate control, heated and cooled front seats, and a 12.3-inch infotainment screen, to name just a few. 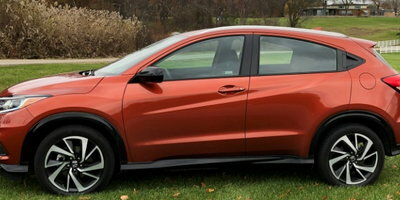 Standard safety features include a rear view camera, overhead camera, blind spot monitor, rear cross-traffic alert, pre-collision warning, automatic emergency braking with pedestrian detection, land departure warning, automatic headlights with high-beam assist, and adaptive cruise control. Our tester, finished in Nightfall Mica, had a base price of $89,980.00. The addition of the Dual-Screen DVD Rear-Seat Entertainment System ($2,005, with wireless headphones, audio/video inputs), and the center console Cool Box ($170), along with a $1,195 delivery, processing and handling fee, it brought the total MSRP to an ear-popping $93,350.00. While capable of crossing the outback, you'll more likely find the LX patrolling tony neighborhoods, coddling occupants while offering impressive towing capabilities. 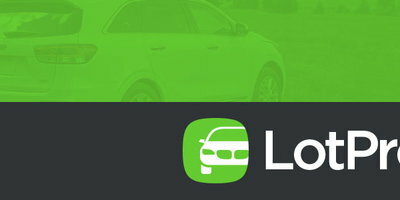 But, brushing aside the fact that most owners will never need – or use – its capabilities, the LX's inherent old-school luxury charm is hampered by stilted handling, an awkward, cargo volume-robbing third row, and appalling fuel economy.